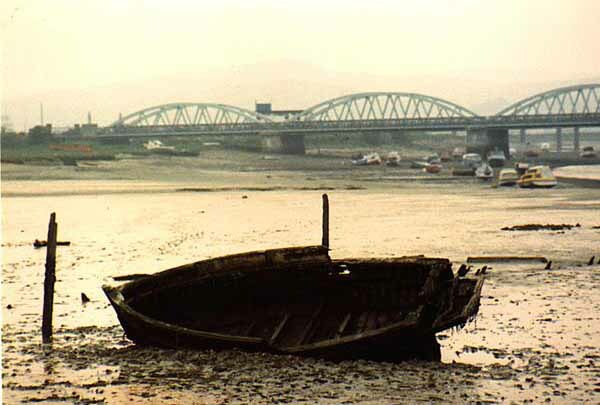 How many bridges are there in the Adur District? 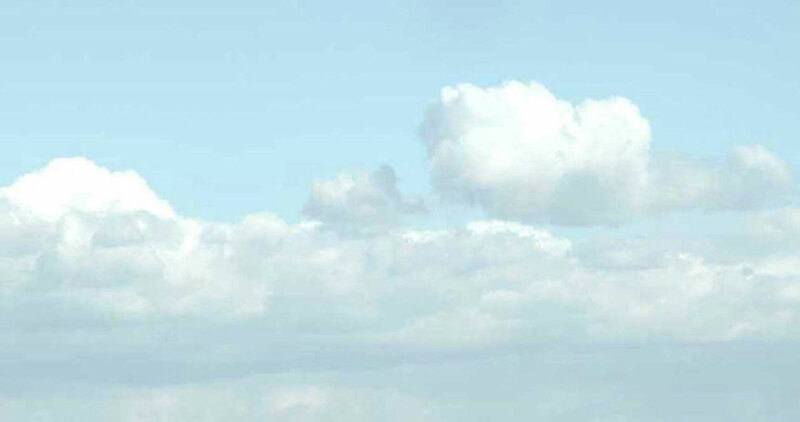 In Shoreham? There are a lot if you count rail and footbridges over roads and small road bridges over water and when is a small bridge not really a bridge at all? 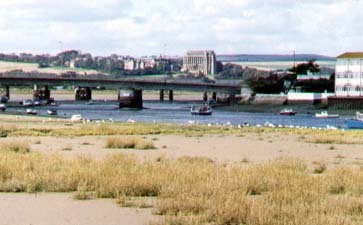 Five bridges span the main stream of the Adur in the boundaries of Shoreham. All them except the flyover impede navigation of craft up and river and as the port moved steadily eastwards over the centuries. 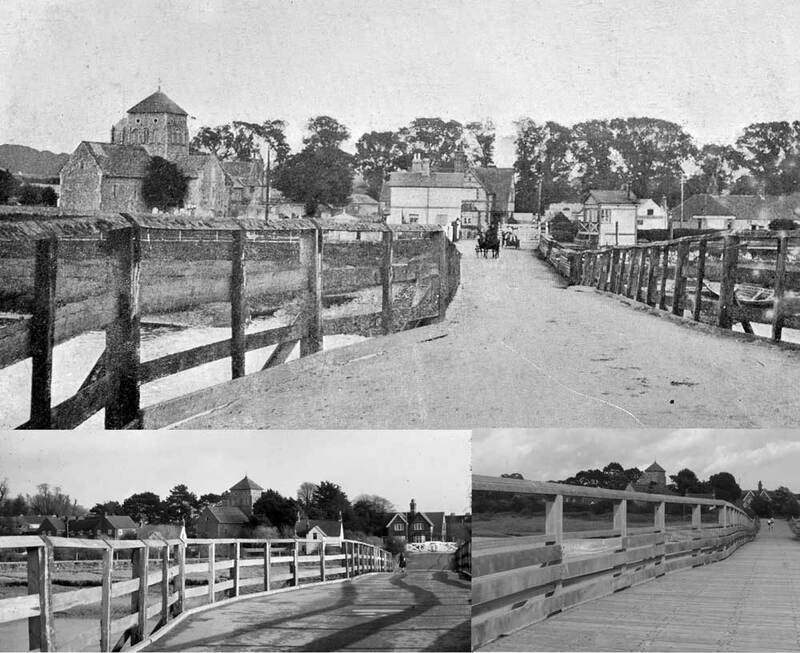 After travellers had to endure a bumpy ferry crossing at Old Shoreham for centuries or when travelling along the south coast had to make a detour to the substantial medieval stone bridge at Bramber, a wooden bridge was eventually completed at Old Shoreham in 1781. This may have been part of the rebuilding of the town after the Great Storm of 1703 that caused destruction along the coast. In 1916 the wooden bridge was rebuilt in the same design* and up to 1970 was the main A27 road for all traffic passing through Shoreham. It was called the Toll Bridge after the railway line to Horsham via, Bramber, Steyning, Henfield, Partridge Green, West Grinstead and Southwater was constructed and opened in 1861 and tolls were collected for all vehicles crossing the level crossing gates on the east side of the river. The bridge closed to motorised traffic on 7 December 1970. I have roughly measured the Toll Bridge to be about 166 metres long. The original tollbridge of 1781 was built of Oak. The reconstruction in 1916 was in Eucalyptus Blue Gum. The British Railways Board finally closed the bridge to road traffic on 7 December 1970. At the time the bridge closed it was the last public road bridge in Sussex to be controlled by a toll. In 1833 The Norfolk Suspension Bridge was opened. 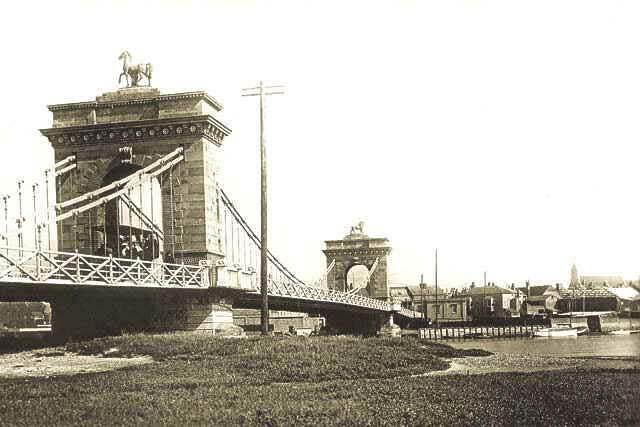 It was the same design as the famous Chain Bridge (originally built 1849) that crosses the River Danube between Buda and Pest in Hungary. W. Tierney Clarke and Captain Samuel Brown designed the first Norfolk Bridge. It was replaced by a Bow String Girder Bridge in 1922, which was in turn replaced by a Concrete Box Girder Bridge in 1987. Contractor's board attached to the bridge reads E.C. and J. Keay Ltd Engineers. I have roughly measured the Norfolk Bridge to be 130 metres long. The first railway from Brighton to Shoreham, via Hove, Portslade, Southwick and Kingston was opened in 1840. It was not until 1845 that the River Adur was spanned with a wooden trestle bridge to carry the line on to Worthing. The current steel bridge replaced the trestle bridge in 1893. This is a wide part of the river and I have roughly measured the length of the viaduct at 305 metres. 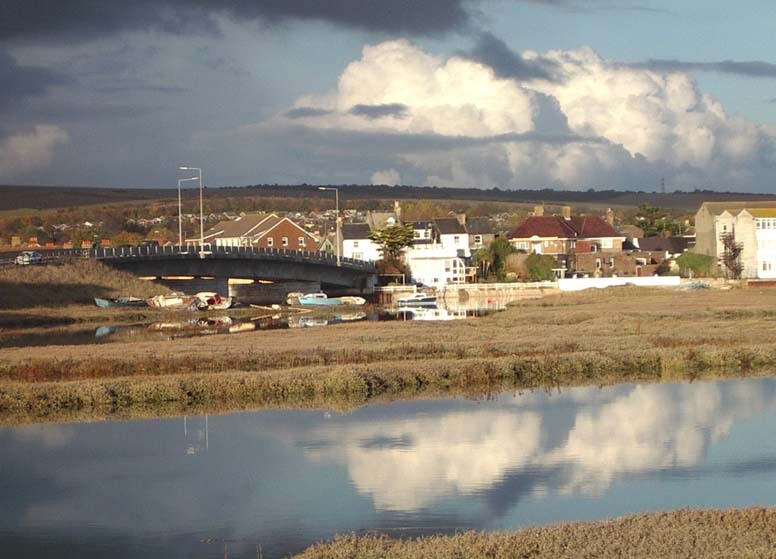 Shoreham Beach did not begin to be extensively populated until the footbridge was constructed in 1921, from the newly named Shoreham-by-Sea, which acquired its suffix in 1910. The central part of the bridge could be opened to allow the passage of large vessels. It was about 225 metres (246 yards) long. The official opening of the footbridge was on 3 February 1921. This bridge was demolished in 2013. There are imminent plans for a replacement bridge. 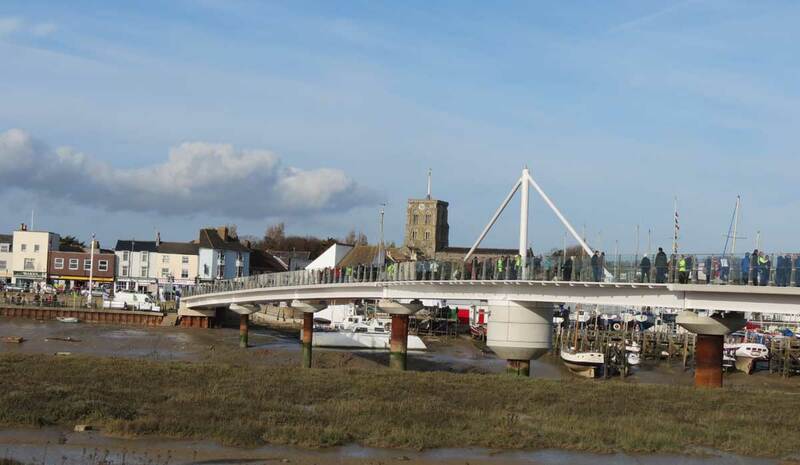 A short pictorial history of the death of the Shoreham footbridge and the birth of the Adur Swingbridge (link to video by Jeremy Croucher). 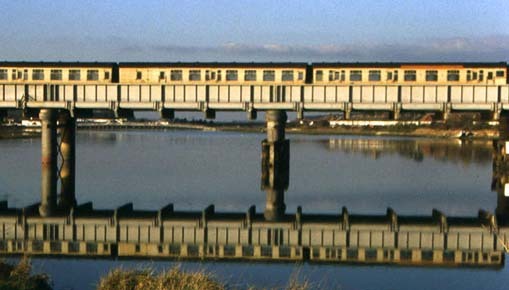 The Adur Flyover was one of the earlier box girder bridges that had problems caused by their design and needed subsequent strengthening. 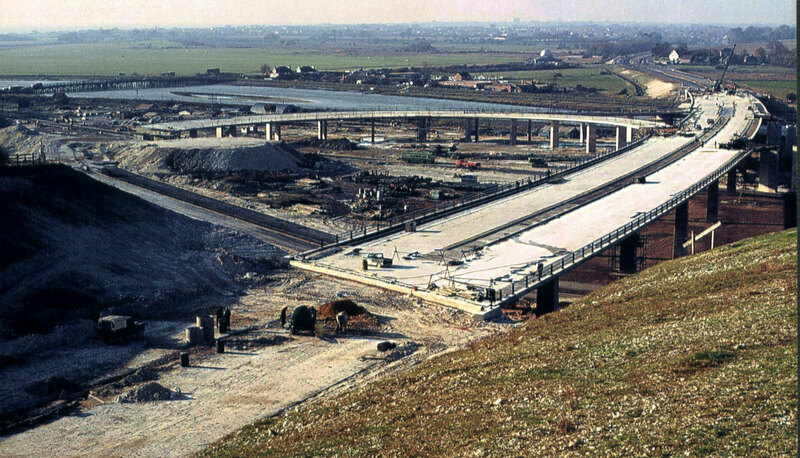 Construction commenced by McAlpines on 1 February 1968. The by-pass opened to through traffic in 1970. The first unofficial crossing by car was on 19 March 1970, the first traffic east to west from 14 May 1970 and both ways on 21 May 1970, although the slip roads did not open until July 1970.